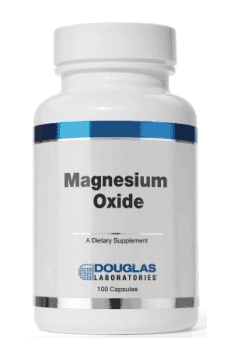 Douglas Laboratories Magnesium Oxide is a top-class dietary supplement containing an element that plays a fundamental role in the body system – magnesium, in the form of oxide. The product is vegetarian-friendly. Magnesium oxide is a non-organic compound that occurs as a mineral in nature, whereas in the body it only appears after its administration as a medicine. In an aqueous environment, it reacts easily with water to form magnesium hydroxide. For this reason, the substance is used to neutralize hydrochloric acid in the stomach or as a gentle laxative, and it also has many other applications. The term "magnesia milk" was first used to name a white, slightly alkaline water-based suspension of magnesium hydroxide at a concentration of about 8%. Magnesia milk is mainly used to combat constipation, but it can also help the digestive system in case of indigestion or to reduce the symptoms of heartburn. mechanism. Its osmotic pressure gathers water from the tissues and increases its retention in the intestinal lumen, thus widening it. The nerves stimulating peristaltic movements in the intestinal wall are triggered, thus facilitating defecation. Magnesium supplements have also been shown to be effective in reducing platelet aggregation by reducing the influx of calcium ions involved in this process. Magnesium is a mineral component responsible for the proper bone structure. It can be obtained from a diet, however, supplements of magnesium are often necessary, in case of its lowe levels, which often happens in women. Magnesium deficiency is also a big problem for the African-American community and the elderly. Low magnesium concentrations are associated with diseases such as osteoporosis, hypertension, hereditary heart disease, stroke, vascular clots or diabetes. Magnesium plays a very important role in maintaining adequate performance during physical exercise. The body of an active person may need as much as 10-20% more magnesium than at rest, depending on the type of activity. Magnesium supports the transport of glucose from the blood to the muscle tissue and the breakdown of lactic acid, which may be stored in the muscles and cause unpleasant pain. Studies have shown that additional magnesium intake can improve the results of athletes, the elderly and chronically ill. In one of the trials, athletes who supplemented magnesium for 4 weeks improved their performance in running, swimming and cycling during the triathlon. In addition, they noted a reduction in the levels of insulin and stress hormones. Magnesium also has a beneficial effect against type 2 diabetes. In about 48% of diabetics, the level of magnesium is too low, which may reduce the ability of insulin to maintain a healthy blood sugar level. In addition, studies indicate that people with magnesium deficiency have a higher risk of developing diabetes. Magnesium is of great importance for the functioning of the brain and a good mood, and its low level is associated with an increased risk of developing depression. One study encompassing 8,000 people showed that people under the age of 65 with the lowest magnesium intake had a 22% higher chance of getting ill. Some researchers believe that the low magnesium content in today's diet may be related to many cases of depression and mental illnesses. Magnesium supplementation may be helpful in preventing and reducing the symptoms of this type of diseases. In summary, Douglas Laboratories Magnesium Oxide is a top-class supplement with a wide range of applications. It helps to reduce the symptoms of heartburn and indigestion and may also be used as a gentle laxative. In addition, it supplements the diet with magnesium ions necessary to maintain healthy bones and improve the efficiency of the workouts. It helps to prevent magnesium deficiency, especially in women and the elderly. Magnesium Oxide 500mg 100 caps. It is best to be taken it with a meal to reduce stomach irritation and prevent diarrhea, or differently, as prescribed by a doctor. Each capsule should be drunk with about a glass of water and swallowed without chewing. Biting the capsule may release the whole dose of the drug at once and increase the risk of side effects. Side effects of magnesium oxide, if overdosed, include diarrhea and irritation of the digestive tract. Magnesium can interact with some medicines, reducing their absorption. If tetracyclines are taken, their administration should be separated by at least 2-3 hours following administration of the magnesium dose. In case of bisphosphonates, thyroidal medicines or quinolones, you should consult a doctor or pharmacist about their use in combination with magnesium. Douglas Labs is a company set up in 1955 by Sam Lioon, who wanted to help Americans change their lifestyles by means of diet and supplementation and his motto “raise standards” is especially visible today, when the brand produces high-quality supplements on a broad scale. In the scope of the company’s activities there are also scientific studies, the sale of supplements is based on and also events, where their achievements and the most current knowledge on supplementation are presented. One of the most pioneering products by Douglas Labs are the preparation supporting hormonal balance, bone turnover and many other with multi-system effect. Cellulose, gelatin (capsule), vegetable stearate and titanium dioxide.